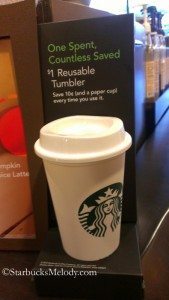 The $1.00 reusable plastic Starbucks cup – Pays for itself in ten uses! I promised myself that I’d slow down on blog posts, but this really caught my eye! 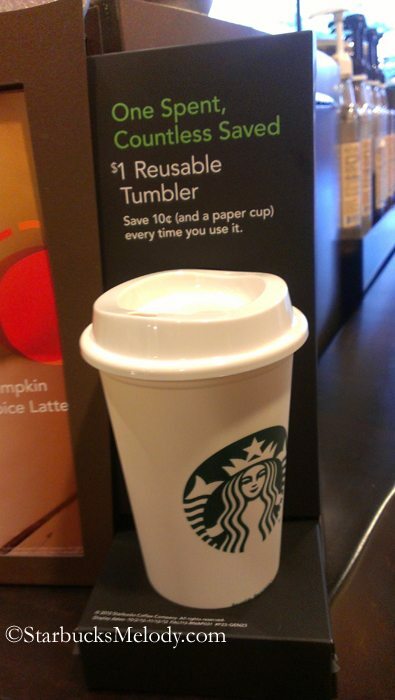 Starbucks is now selling (as of October 2, 2012) a Grande-sized (16 ounces) re-usable plastic cup. The price tag is only $1.00. This cup is essentially a plastic cup that looks like the iconic Starbucks paper cup – it’s much thinner than a typical re-usable tumbler, but it is sturdier than a paper cup. Because it’s a thin plastic, it’s estimated to have a lifespan of about 30 uses. It’s only $1.00! Use it ten times, and it’s paid for itself with the cup discount. When you use your own cup, mug, or tumbler at Starbucks, you save ten cents on your drink. Starbucks has been trying all kinds of things to try to get people to bring in their cup more often. For example, on Earth Day, Starbucks typically offers free brewed coffee to customers who bring in their own cup. Another example happened in January this year. Some might remember that Starbucks offered a special promo tumbler where if the customer brought in that tumbler during January this year, brewed coffee was free. The percentage of customers who really bring their own cup, mug, or tumbler into Starbucks is embarrassingly low. Hey customers, please start reusing your own mug or cup! According to the 2011 Starbucks Global Responsibility Report, for several years in a row, the rate of customers using a personal cup has been less than 2 percent of all transactions. That’s shamefully low. In 2009, only 1.5 percent of transactions included a personal cup discount. In 2010, that number was 1.8 percent. And in 2011, it had only grown to 1.9 percent. There are only two things that will improve that number: First off, customers have to make it habit to use their own cup. Keep it in your car. Throw it in your tote. Throw it in your briefcase. And secondly, the baristas at the registers cannot forget to ring in that personal cup discount. That’s it. Of course the larger issue is actually getting customers to bring in their own cup. With this new plastic cup, it will pay for itself with ten uses. Then after that, you throw it in your recycling because both the cup and lid are fully recyclable. My understanding is that because it is a fairly thin plastic, you will likely still need a sleeve for your beverage. For your information, I’ve been told that it’s dishwasher safe for the top shelf of a dishwasher. I’ve already heard partners saying that they didn’t get a lot of these cups in stock, so if you’re going to get one, don’t delay. Would you use this little cup? What do you think? Edit on October 3, 2012: This appears to be a Pacific Northwest item only. Hopefully there will be a national launch of this later. Happy Leadership Conference to all the Starbucks partners in Houston. Friday Open Thread – Starbucks French Roast Via time! Hey guys! There’s any chance that I can find one to buy online? Unfurtunately I live in Italy where there are no Starbucks coffee shops…too bad for me that I love them so much! Much to my surprise, these $1 cups are going for nearly $10 on ebay! Thanks for the update Nathan! This is a good idea, but hard to use. I just broke three nails trying to get the lid off? Anyone know what the trick is? @Barb – grasp the cup with both hands, thumbs facing up, with both thumbs gently push upward on the base of the lid and it will pop loose. My Daughter has wonderful naturally long fingernails (people remark and her manicurist is amazed) so “Dad” is always helping her come up with ways to preserve her nails. the ones from Taiwan or HK are sketch. For example, as far as I know, Starbucks first introduced these in Seattle late 2012 to begin with. But Starbucks in Tawian has them too? Not to mention the cups look different. The catchphrase is missing from the Chinese ones, not to mention the bottom looks totally different. I have seen the real ones being sold on ebay for $4.99. More than the $1.00 you can get at the store but, you pay for shipping and a little profit I guess. I am sad to report that Starbucks has doubled the cost of these reusable cups to $2 each. It happened overnight and without warning and no one seems to know why! @Jess J – There is possibly a logical answer to your comment above. The plain white re-usable cups are one dollar. However, when those get replaced with more decorative limited-time cups (this happened during the holidays last year) the price goes up to $2. Then, when the decorative cups sell out, or for some reason are no longer sold, and the plain white cups return, they are one dollar. Right now, the plain white ones are replaced with the ones with an artistic design on them – those will be a little more money – two dollars. I know I’m late to this particular party… but are these Starbucks cups still available anywhere? I had used my own tumbler everytime ( about 3-5 times a week I go to starbucks) in Korea. Since I moved to the states, I have stopped using it after acouple times for 2 reasons. In Korea, 300 won (little less than 30cents) is discounted for using a reusuable cup. On top of having only 10cents discounted, either I forget to ask for a discount or partners forget to give the discount. Venti was 21oz. In Korea. I felt 24oz. Tumbler was quite bulky to carry in my bag. But I love the plastic thin resuable cups so much that I collect every version. I should start to bring my own resuable. Thank you for your posts!!! I just found out about this gem and love your site!!! Also, we can put discount for a use of tumbler even with the mobile orders in Korea. We just have to bring the tumbler to barista before they start to make it. How are we buying $1 cups? @fred It’s a 5 year-old blog article. Maybe 5 years ago you bought a $1 cup.